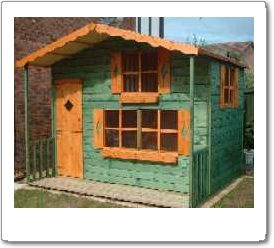 Davies Timber Wales is a family run business, established in 1989 in Cwmbran, Gwent. We provide a first class service to the trade and to the public, offering top quality custom built timber products at unbeatable prices for Wooden Garden Sheds, Timber Garden Rooms, Wendy Houses, Play Houses, Summer Houses, Tool Sheds, Potting Sheds, Fencing Panels, Garden Gates & Timber Decking. Our buildings our made to roof size, unless stipulated otherwise by our customer on ordering. We manufacture in our workshop a wide range of sectional timber buildings ranging from small sheds to large custom built workshops. Each building is made to measure from your choice of materials, Pressure Treated Heavy Sawn Overlap, Tongue & Groove, Tanalised Tongue and Groove or Log Lap . We offer a range of optional extras, such as Double Glazed Units, Hard Wood Ply Floors, Lining & Insulating, Felt Tiles and much more. Timber buildings that are made by us are available flat packed for self-assembly or we offer an erection service. We deliver locally in Cwmbran, Torfaen, Newport, Cardiff, Caerphilly, Monmouthshire, Blaenau Gwent, Rhondda Cynon Taf & Vale of Glamorgan. We also stock a huge selection of loose pressure treated (Tanalised) fencing timber, European Fence Panels, Decorative Deck Panels and various garden timber products, including cheap fence panels, picket fence panels, trellis, garden gates, picnic tables, dog kennels, planters, met posts, decking materials, Shed & Decking Treatment etc.